How do you design an application using Agile methodologies that will be capable of scaling to become a distributed application running across thousands of servers and handling thousands of customer requests per day? Especially when the application itself must be highly extensible and coordinate interaction with external services (many of which can be slow or unreliable at times)? Scalable systems design is one of the most common challenges facing modern software development. Scalable system design must address many difficult issues, including: fault tolerance and recovery, coordination, and even deployment synchronization. There are many different approaches to this problem, but one simple yet very powerful approach has been used by GoDaddy's Hosting group: using an Actor Model. The Actor Model was conceived in MIT's Artificial Intelligence labs back in the mid 1970's but it has recently seen renewed interest because of the way it addresses development architecture. GoDaddy uses the Python language for many of it's internal systems and has developed an Actor library for Python called Thespian to support this highly-scalable architecture. GoDaddy has open-sourced the Thespian library itself to share it with the community and allow others to leverage the Actor Model architecture for Python. The Actor Model itself is pretty simple, but it's the way that it frames the problem that creates big advantages. A program's code is divided into multiple different parts and each part runs as an Actor. Each Actor has an address, and Actors can exchange messages by sending a message to another Actor's address. Actors do not share state (i.e. memory), but they may maintain their own internal state. At first glance, that sounds pretty trivial, but the power of the Actor Model lies more in what is not described above: Actors do not have to spend time managing their environment, establishing and maintaining a communications framework to each other; there are no locks, semaphores, or other complex concurrency concerns. All of these things are handled by the Actor System (the framework in which the Actors run), and the Actors are freed to focus on the main concerns of the application. Providing appropriate scheduling and concurrency between different Actors. One of the first things you'll notice when writing Actor-based code is how easy it is to write code for. While it is possible to provide configuration information to customize your setup, it is often not necessary to specify anything for a simple environment. Actors don't need lots of setup code and management. With many libraries, you simply include a module, subclass a base Actor object to define the Actor code, then create the Actor in a single library call. To demonstrate how easy this is, let's look at an example using the Thespian Python Actor library. This will place the thespian package in the standard python library installation location. Thespian is supported for any version of Python starting with 2.6, and has no required dependencies. You may wish to additionally install the setproctitle library: Thespian will make use of this if it is available to update the process description of running Actors making it easier to identify them in `ps' output. Line 3 shows how the Hello class subclasses the standard Actor baseclass provided by the thespian import. 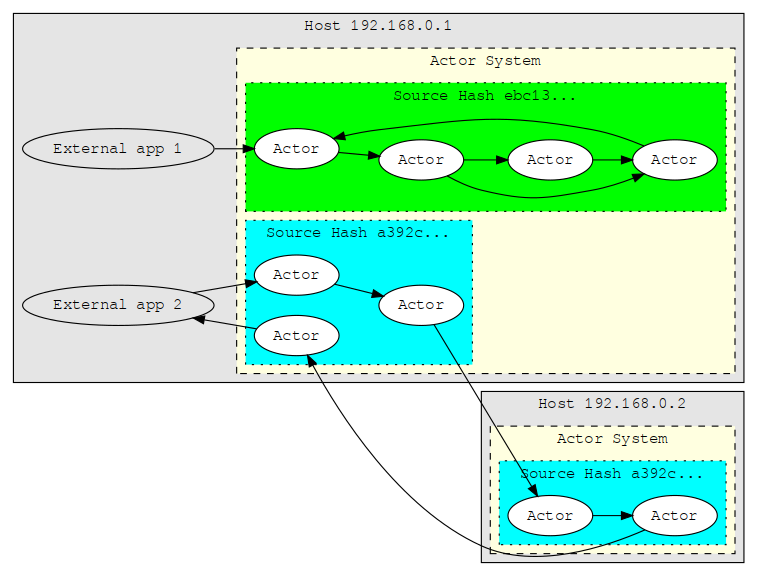 The Actor baseclass provides methods for all of the actions that Actor might take that would interact with other Actors or the Actor System itself (see the Using Thespian documentation for more details). Line 4 is the main entry point into any Actor. It is invoked (by the Actor System) to deliver a new message to the current Actor to be processed. In Thespian, messages can be anything that can be pickled. In this particular example, the incoming message is ignored, but it can be used in any way desired by this Actor. The sender is the Actor Address of the Actor that sent the message. This Actor Address is opaque to the Actor: it can save the address and use it to send messages, but it doesn't know what is in the address. When the Actor's receiveMessage() method exits, the Actor sleeps until another message is delivered to it. Each Actor processes only a single message at a time. Line 5 shows how an Actor sends a message. Just the message and the target Actor's Address are needed. In this case, the response message is sent back to the same Actor that generated the incoming message. These 3 lines define the Actor itself. There can be any number of Actors running, but lets keep it simple for the moment. The next couple of lines in the Hello World example are a little different though. The Actors operate within the Actor System, but the Actor System itself must be started and handle communications to the Actors from the external world. Line 8 actually performs two actions. The first portion of the line gets a reference to a running Actor System, starting one up if one is not already running. The second portion of the line calls that Actor System and requests the creation of an Actor (of the Hello class) within that system. The result of this createActor() call is an Actor Address. Line 9 then calls the ask() method on the Actor System to send a message to an Actor within that system and wait for a response message. In this case it sends a text query as the message, but as discussed previously that message is immaterial: the Hello Actor will always generate the same response. The additional argument (the value 1.5) specifies a timeout period: if there is no response from the actor in 1-and-a-half seconds then the return value from the ask() will be None to indicate a timeout. Notice that even though the ask() is generated by regular code (i.e. not an Actor) via the Actor System, the Actor itself simply sees a message from a sender. The ActorSystem assigns an Actor Address to the code issuing the ask(), so when the Actor calls send() with that target Actor Address, the result is delivered to complete the ask() call. It's worth pointing out that the way an Actor responds to any message depends entirely on the way the Actor code is written. There is no requirement that messages be reciprocal and that a response must be generated for each received message. In fact, an Actor is free to send several responses, or even no responses upon receipt of a message. sends a message and waits for a response message (or a timeout). Note that the response message does not have to be from the same Actor that the input message was sent to, and the receipt of any message counts as a response. queues a message for transmission to the indicated Actor and returns immediately. The message may or may not have been delivered to the target Actor by the time this call returns. waits for a response message or a timeout. The ActorSystem() call is a singleton, creating the Actor System the first time it is called and subsequently simply returning that same Actor System. This topic will be discussed in more detail later on. Once an Actor System is no longer needed its shutdown() method can be called to release it an all associated resources. Any Actors running in that Actor System will also be terminated when the Actor System is shutdown. In the Hello World example above, only a single Actor was created and used. It's actually possible to create any number of Actors (subject to system limits), and for Actors to create other Actors. In the hellogoodbye example, the Hello Actor does not send a message directly back to the sender, but instead passes the sender's address to another Actor that it creates on the fly (in line 6). The second Actor (World) receives a tuple which is the combination of the original sender's address and the first part of the message (created in line 7). The World Actor updates the message and then sends the resulting message to the original sender (line 14). The main code (outside the Actor System) has also created another Actor (the Goodbye Actor). The message printed to the console in line 24 is the result of calling both the Hello and the Goodbye Actors (and indirectly the World Actor). When the Actor System delivers an ActorExitRequest to an Actor, it will pass that message to the Actor's receiveMessage() method to allow the Actor to perform shutdown activities. Once the receiveMessage() returns from handling the ActorExitRequest, the Actor System will destroy the Actor. If the Actor does not need to do any operations prior to being destroyed, it is free to ignore the ActorExitRequest message, but the if statement in line 12 ensures that when the World Actor receives the ActorExitRequest it does not try to interpret it as the greeting message it expected from the Hello Actor. Whenever an Actor exits, the Actor that initially created it will be notified via a ChildActorExited message. This message is generated by the Actor System and specifies the address of the Actor which exited. This is why there is also an if statement in line 5 above: when the World Actor exits the Hello Actor should not create another World Actor and send it a message—this would result in an infinite loop! There are other messages that can be delivered to an Actor by the Actor System (all derived from the ActorSystemMessage base class); these will be described in later parts of this article. Any Actor is free to ignore any of the messages delivered by the Actor System: they are designed to allow for additional functionality (e.g. restarting Actors that have exited) but only if that functionality is needed or desired. As the hellogoodbye example above demonstrates, Actors can easily be created (and destroyed) on an as-needed basis. This offers considerable flexibility in the design of your application. One example usage of this ability is easy horizontal scalability by creating multiple instances of the same Actor and distributing messages across those instances (e.g. round-robin). Just as the Actor model supports Horizontal Scalability, it's also naturally promoting a highly-modular Separation of Concerns approach. Each Actor should be written to handle a single, specific purpose. Other concerns should be handled by other Actors. This encapsulation results in loose coupling helps ensure a good overall application design, prevents "spaghetti" code, and increases overall reliability and fault tolerance. In the example above, the Hello Actor delegated functionality to the World Actor without affecting the delivery of the result because the Hello Actor and the requester are loosely coupled. A design update could easily insert other Actors into the flow without significantly perturbing the existing Actors and their functionality. 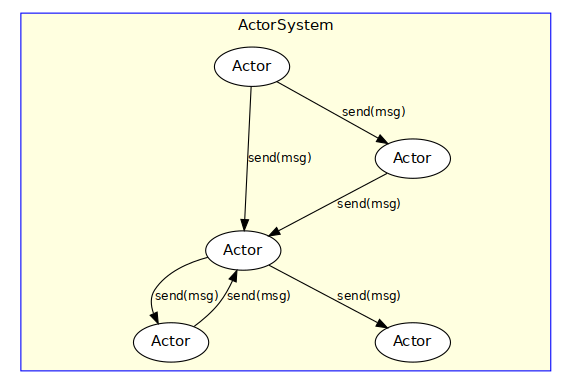 The ActorSystem Base determines how the Actor System implements the Actor concurrency and transport elements for supporting the Actors. There can be bases for implementing Actors as separate processes, or separate threads, or simply sequential execution. There can be system bases that use UDP to communicate between Actors and system bases that use TCP, bases that use a message bus, etc. The choice of system base can be made almost completely independently of the Actor code, which allows for significant upgrade and operational implementation flexibility. The Actor System represents a higher level of abstraction than other models (e.g. a message bus "pub/sub" architecture) which helps decouple the Actor internal logic from the transport and concurrency issues. An Actor-based application could be implemented with an Actor System running on top of a pub/sub transport, but if the pub/sub transport needed to be changed to a different transport this could be done by simply changing the system base and there would be no impact on the Actors themselves. The primary argument to the first ActorSystem() call specifies which system base to use (recall that ActorSystem() is a singleton, so it's only necessary to pass any initialization arguments to the very first call). Different "bases" provide different Actor System-level functionality; they do not change the way that Actors work but they change the way that they are implemented. The Using Thespian guide defines the set of available system bases available for Thespian. By default, the "simpleSystemBase" is used, which runs all Actors synchronously in the current process. While this base is very useful for debugging (see the Debugging section), it does not provide the level of concurrency usually desired at production time. Assuming you have the setproctitle package installed, the ps listing above shows a number of processes, including a Hello Actor process, a World Actor process, and a Goodbye Actor process. Each ps entry shows the Address of each Actor (including the TCP IP address and port number). In this output we can see the previous TCP transport-based Actors are still present, but now there are a set of UDP transport-based Actors as well. These processes are specific to the multiprocTCPBase system base (there are an equivalent pair for the multiprocUDPBase). The MultiProcAdmin represents the "Actor System" itself and is responsible for coordinating the Actor process creation and deletion and message delivery responsibilities of the Actor System. The logger provides coordinated use of the python standard logging facility for all of the Actors managed by that Actor System (an optional argument to the Actor System can specify the logging facility configuration). Each time the above tests are run, a new set of Hello, World, and Goodbye Actors are created. Feel free to play around, and when you want all of them to be deleted, simply uncomment the Actor System shutdown() call in line 25 above and run it one last time: although new Actors are created each time, each run will automatically connect to the existing Admin for that system base, so shutting down that Admin will stop all Actors in that Actor System. As mentioned above, the Using Thespian document provides much more detail about the available System Bases for Thespian and their capabilities. Other Actor System implemntations may or may not have similar configurability. One of the trickiest parts of using Thespian is in properly starting and/or using the desired SystemBase. For process-local bases (like the simpleSystemBase), this is not an issue because the system base only exists during the lifetime of the application. At boot time a startup script starts a Thespian multi-process base, providing various base configuration information at this startup point. Applications can utilize the existing base, and other systems (as described later) can interact and utilize the current running Actor System. $ edit hello.py  # <-- change "world" to "universe"
Note that although the code was updated and the application was run again, that the ActorSystem call in line 3 re-connected to the existing Admin. Even though the previous run had stopped the Hello Actor itself (via the exit request in line 10, the code used to start the new instance of the Hello Actor was still the original code that the Admin process inherited when it was first started up. This however will stop all other Actors that are currently running in that system base. The alternative is to dynamically load the new source code as described in Dynamic Source Loading. Thespian supports the standard logging library, but provides some enhanced handling of log messages to accomodate the different system bases that may implement Actors in separate processes (or even on separate systems): as described in the Logging section of the Using Thespian documentation, log messages are forwarded to a "Logging" process to be written according to the logging configuration supplied when the ActorSystem() initialization call was made. In addition, for multi-system configurations, any messages of Warning level or higher are forwarded to the Convention Leader for logging there as well. INFO:root:Hello actor got: are you there? The logging statement on line 6 has generated the INFO statements (except for the first which came from the Thespian ActorSystem itself) in the output above because the default logging configuration is to write to the console. To customize the logging (for example, to write to a file called hello.log), pass the logging configuration dictionary to the ActorSystem() call as the logDefs argument. INFO     Hello actor got: are you there? Note that in the above examples, the multiprocTCPBase is used. If the default simpleSystemBase is used no logging output appears for the first example (where no logDefs argument was specified). This is because the default logging level for the simpleSystemBase is set to logging.WARNING; the second example uses specific logging configuration which overrides the default. In the examples shown above, messages were delivered to the different Actors and those Actors processed those messages. One of the important things to note is that each call to an Actor's send() method is asynchronous: there is no guarantee that the target Actor has received—or processed—the message by the time the send() method returns. Each Actor will only process one message at a time. It must return from the receiveMessage() handling of the current message before the next message will be delivered to the Actor. Thespian guarantees that messages sent from Actor A to Actor B are delivered to B in the same order that they are sent by A, but if Actor C is also sending messages to Actor B there is no guarantee that A's messages and C's messages will not be commingled. Actors thus operate on individual messages, running when a message is received and finishing when they exit from the receiveMessage(), during which they may have created other Actors or sent other messages. This message passing paradigm is different from the conventional blocking paradigm used by most code. In Thespian, there are no need for special objects like futures that hide asynchronous functionality behind what looks like synchronous code. If an Actor does block during the receiveMessage() execution, it will not receive other messages while it is blocked; the typical method of addressing this in an Actor model is to start up more Actors or delegate the blocking functionality to a sub-Actor that was dynamically created as needed. This obliviousness of the Actors to the underlying concurrency and scheduling implementation is a very powerful abstraction. This means that the concurrency is completely determined by the Actor System itself, and that the concurrency can be changed by the Actor System without impacting the Actor code itself at all. For example, depending on the ActorSystem Base selected, Thespian could implement each Actor as a separate thread running in the current process. The next time the application was started, it could use an Actor System that implemented each Actor as a separate process instead of a thread—as simply as that. This allows another vector of scalability for the application: it is not necessary to choose which concurrency method to use (threads, processes, pools of either, greenlets, etc.) when writing the application's core logic: simply start with an Actor System implementing one and switch to a different Actor System if a different concurrency type is needed later on. Multi-threaded applications are very difficult to debug, and multi-process applications are even worse. Stepping through code, setting breakpoints, determining what sequence of operations has occurred, or even collecting coverage information is very difficult when this type of execution parallelisim is running. As discussed above, Actors can be any of these types of concurrency, but most importantly, the concurrency type can be changed without affecting the application code in the Actors. Thespian and other Actor Systems provide a mode whereby there is no concurrency: each Actor's receiveMessage() is executed one after another serially. If the above had been running each actor in separate threads or processes then the coverage report would not have been able to determine 100% coverage. Absolutely no change was made to the code under test to achieve this, and the only difference was passing a specific argument to the initial ActorSystem() call. This argument will be discussed in the next section. When an Actor wishes to send a message to another Actor, it uses the self.send() method and specifies the Address of the target Actor. That Address cannot be generated by the sending Actor: it must have been given to the Actor as the result of a self.createActor() call or in the body of a message passed to it's receiveMessage() method. Actors must treat the Address of another Actor as an opaque object; the actual information in the Address is determined and used by the currently running Actor System, and it may change between runs of the Actor application. One advantage of this opaqueness of Addresses, and also of not having shared state is that Actors have no direct interaction with each other: they only interact via asynchronous message delivery. 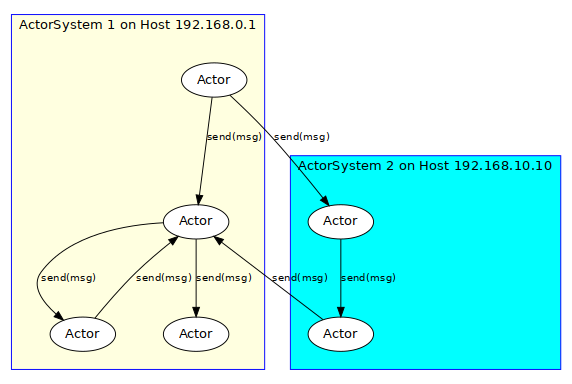 This means that the sending Actor doesn't know or care where the target Actor is: a thread in the same process, another process on the current host node, another host node in the same datacenter, or a host node halfway around the world. This is known as location independence and means that the Actors operate independently of their relative locations. This allows Actors to be distributed throughout the available environment as appropriate… again without any changes to the Actor application code itself. The combination of location independence and Horizontal Scalability means that Actor-based applications are particularly well suited to cloud-based solutions where changes in the relative size of the cloud deployment can be realized through duplicating, moving, or de-duplicating Actors. Thespian allows different Actor Systems to identify what capabilities are present in the current environment. These capabilities are expressed as free-form key/value pairs, and each Actor can provide an optional static method that will be called before the Actor is created with those capabilities to see if the capabilities of the current system match the Actor's requirements. The DBUpdate Actor above must be able to access a database to run properly; if the current host node does not have network access to that database then the Actor should be run on another host that does have access to the database. The actorSystemCapabilityCheck() in line 7 checks the capabilities argument (which is a dictionary provided by the current Actor System) to see if the needed capabilities are there. The actorSystemCapabilityCheck() method returns True if the current capabilities are valid for it to be created, or False if the current Actor System is not valid and the Actor cannot run in this Actor System. There is also a requirements argument in line 7 that the Actor can check: the self.createActor() method can be called with an optional requirements dictionary that lets the creating Actor pass requirements to the Actor it is wishing to create. Capabilities and requirements are both arbitrary key/value pairs, and any pickleable data may be specified as a key or value in these dictionaries. Each system checks to see if it can access the database successfully and sets another capability if it can. This capability is the same capability that the DBUpdate Actor above requires to be able to run. Each system starts the Actor System with the specified set of capabilities. The Actor Systems will join the Convention run by the Actor System at the specified address and report their capabilities to each other. If the DBUpdate Actor startup occurs in an Actor System that is on a host node that does not have access to the external database server, the actorSystemCapabilityCheck() will return False. That Actor System will then check with other Actor Systems in the same Convention to see if any of the other systems can support the Actor. If another host node does have access to the database, then the Actor will automatically be started on that other system. The Actor is still fully accessible from the local host node or any other node in the Convention that has the Address of the Actor. It is also possible for Actors to dynamically update the system capabilties; if the DBUpdate Actor loses database connectivity it can call self.updateCapability('Has DB access', False) and exit. Any DBUpdate Actor creation after that point will no longer create the Actor on this system. This technique allows the multi-system application to Dynamically Reconfigure itself to work around failures. Any modern application must be capable of dealing with faults, and this is definitely true of a distributed system which has by its very nature many additional places where faults can occur. The same benefits that make Actors easy to use with Location Independence also make them resilient to Faults in the system. Because Actors do not share state and only communicate via message passing, the failure of an Actor does not directly affect any of the other Actors running in the system. The Actor System itself will be aware of the Actor failure and can take corrective action but the other Actors in the system are oblivious (unless they choose otherwise). The Actor System will restart the Actor and re-deliver the message that it was processing when it failed (all other inbound and outbound messages for that Actor are unaffected). If the Actor fails again processing the same message, the Actor System determines that it is the message that is causing the problem. The Actor System will restart the Actor yet again, but it will not deliver that same message to the Actor. The Actor System will wrap the message in a PoisonMessage wrapper and send it back to the Actor which originally sent the message. This originating Actor is free to ignore this PoisonMessage, or it can provide operational recovery handling. The failed Actor will resume processing messages with the next message to be delivered. Clearly the application logic embedded within the Actors must decide whether or not action should be taken on the PoisonMessage as determined by the overall funcationality of the application. The advantage provided by the Actor Model is that the default mode of operation is to preserve the functionality of the application as a whole and to localize the impact of that failure. This is in marked contrast with monolithic applications, where by default an exception will cause the termination of the entire application and even caught exceptions can still be significantly disruptive, including interfering with concurrency. Updating source code running in persistent ActorSystem base instances (as described in Base Persistence). Ensuring that the same version of Actor sources are running throughout the environment. Only loading new code on systems "on-demand"… i.e. when an Actor is started on that system that uses the associated code. As indicated previously, GoDaddy is using a distributed Actor environment that spans over 9,500 active systems. This presents a challenge when deploying new code into the environment. A conventional deployment using yum repositories or Spacewalk will take a considerable amount of time to individually update all of these systems. By using Thespian's dynamic source loading feature, these upgrades can be done more quickly and with less service impact. Dynamic Source Loading is done by allowing new source "images" to be loaded in zip-file format to a running Thespian environment by calling the ActorSystem.loadSource() method. Each loaded image has a unique hash identifier, and ActorSystem.createActor() requests can specify the image hash from which that Actor is to be created. The Actor self.createActor() can also specify a hash value, but the hash defaults to the same hash from which the Actor itself was created, so all Actors default to executing from the same image. System images may be explicitly unloaded from Thespian by calling the ActorSystem.unloadSource() method. For security purposes, there is a special Actor that can register itself as the "Source Authority". Any loaded image is passed to the Source Authority for validation before it is useable for createActor() operations. The Source Authority can perform whatever validation it chooses on the loaded image (e.g. validating a signature); images which are not approved by the Source Authority are rejected and cannot be used. For the example in the section below, the following script is run first to startup an actor system and load a Source Authority that will accept any loaded sources. Because the Thespian Actor Systems communicate as part of a Convention, the source image only needs to be loaded on the Convention Leader system. When the createActor() is called and the capabilities require the Actor to be created remotely, the remote Actor System is told the Actor and the source image hash. If the remote Actor System does not have that hashed source image available already, it will request it from the Convention Leader and then use it to fulfill the Actor creation request. There is no limit to the number of currently loaded active sources (other than available system memory) and the loaded sources function independently of each other. Multiple instances of the same application can be loaded, as well as multiple different applications sharing the same Actor System. This example creates the zipfile from itself (with a couple of assumptions… this is just an example) although normally you would distribute your code as a zipfile generated by $ python setup.py sdist or something similar. The zipfile is loaded into the currently running Actor System in line 17 and then the creation of the Actor in line 19 uses the hash value obtained from loading the source to specify which source the Actor should be created from. Note also that the Actor to be created is referred to by name instead of by reference, and that name is qualified by the zipfile name to match standard Python import semantics. $ edit hi.py  # <-- change "world" to "universe"
The sources loaded remain loaded until unloaded via a call to unloadActorSource() or until the Actor System exits. Thespian comes with a command-line application shell which can be used to interact with existing Actor Systems. This is especially handy to use with persistent Actor Systems to obtain information and perform manual testing. At startup, the start command should be used to specify which Actor System base and parameters should be used. This command internally generates an ActorSystem() API call, so it will either create an Actor System or connect to an existing persistent Actor System. At that point, commands may be typed, including the ability to send simple string messages to Actors. The help command can be used to obtain more information, and the exit or quit commands can be used to leave the shell. The thespian shell provides special handling for Actor Addresses. Rather than being required to type the full Actor Address each time, the shell provides the address command which can be used to "register" an Actor Address. Each registered address is assigned an index, which is always shown in square brackets following the address itself. All other commands use this index to refer to a specific address. There is also a test Actor that is part of the shell. The test Actor simply sends back anything it gets with a message that it received it, unless the message is the string "create", in which it will create another TestActor and return the address of that Actor. The shell also supports issuing status queries to Actors. The status query returns various information about the Actor. The status information may change over time and should not be programmatically relied upon at this time. The methods and capabilities introduced by this article are relatively easy to learn and incorporate into application design, especially for cloud-based applications.